At left, finally. 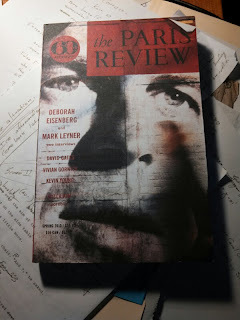 I've been waiting for this issue of The Paris Review like an eight-year-old's birthday party. It's a civilization which I'm allowed to hear in tales but not allowed to visit, yet. I wanted to share a little of the edit tonight. It isn't very important and it won't matter to most of you. It's as meaningful as the warm stones around a fireplace in the morning after the coals themselves have lost any light. You know there was a fire and there may be one again but in the end, it's just some warm rocks stacked inside the house, with you. "I'm not playing," she replied still looking at the books. "This is your game. Play it by yourself. I'm the bad student and you're the administrator. I'm supposed to feel remorse or fear or ashamed. Well - I don't. I don't feel anything. I'm here to learn so start teaching. Oh - and if you touch me, I'll have you killed." She regretted that the moment it leapt from her lips and they made her small. It was her first ill-considered action of the week. Right. Ghastly enough for a rough draft, isn't it? It's a bit of Steig Larsson after two bottles of vodka and a brain injury. I was pounding the text trying to find the story and that took a while. Horrendously uninteresting. Here's a draft revision and then I'll speak to some of the choices, briefly. "I'm not playing," she replied. "I'm the bad student and you're the administrator. I'm supposed to feel ashamed or afraid. Well, I don't." Kait shifted and squared herself. "I don't like being alone with you." The words floated and made her small. Her head twisted but the neck tightened anyway. Her ears flushed. She hoped he'd see anger but she knew embarrassment, the cousin of shame. I like the brevity (and after the rough draft who wouldn't?). I also like the way the language tells us more about the Kait than about her actions. 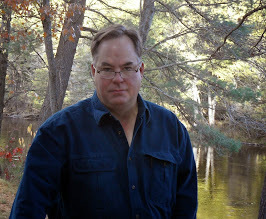 In the first version all we have the poorly constructed mock-tough of the amateur troublemaker. In the second, we have a the honest-enough assessment of someone in a bureaucratic pinch of little meaning (permanent record and all) and the remorse which accompanies the unhelpful threat impulsively launched but pulled back in its execution so far as to be impotent.